BRONX, NY, July 19, 2016–The Doe Fund and New York State officials, including Homes and Community Renewal (HCR) Commissioner James S. Rubin, Office of Temporary and Disability Assistance Commissioner Samuel D. Roberts (OTDA) and Health Commissioner Dr. Howard Zucker (DOH), today announced that construction is underway on Webster Green, a 100 percent affordable housing development in the Norwood section of the Bronx. Webster Green is part of Governor Cuomo’s unprecedented commitment to affordable housing and community renewal, which includes $20 billion in the FY 2017 Budget for comprehensive statewide housing and homelessness action plans. The $29.5 million new development, located at 3100 Webster Avenue, will provide 82 affordable apartments for vulnerable New Yorkers, including 41 homes for low-income individuals with health-related issues. Onsite social, medical and support services will help stabilize their treatment protocols and successfully integrate residents into the community. Financing for the project was provided by HCR, OTDA, DOH and other public and private partners. Fifty percent of Webster Green’s 82 apartments, developed by The Doe Fund, will be reserved for eligible low-income households at or below 60 percent of area median income, with preference for local area residents who are either homeless or at risk of becoming homeless. 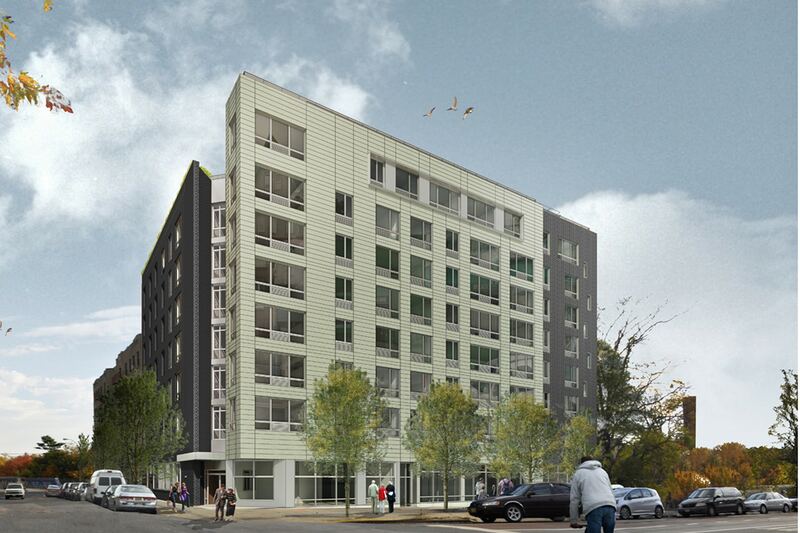 The remaining supportive housing apartments will go to low-income adults with disabilities. Gross rents – rent plus utilities – for the units will range from $852 to $1,096. Outdoor recreation space, a community room and residence lounges will complement the high efficiency LEED certified building and foster resident engagement to help tenants achieve and maintain healthy lifestyles and self-sufficiency. Support program offices will be co-located on site per the successes of the supportive housing model that provides better health outcomes in place of repeated costly hospitalizations for high-need Medicaid clients. On June 24th, HCR released new financing to build 1,200 supportive housing units, fully funding the first of the five-year plan to build 6,000 supportive housing units. Over the next five years, the $10 billion housing initiative will create and preserve 100,000 affordable housing units across the state, and the $10 billion homelessness action plan will create 6,000 new supportive housing beds, 1,000 emergency beds, and a variety of expanded homelessness services. The state invested more than $12.2 million to finance The Doe Fund’s development of Webster Green, including: a $1.2 million allocation of Low Income Housing Tax Credits and a $4.5 million Medicaid Redesign Team program loan through HCR; $6.5 million in Homeless Housing Assistance Program funds through OTDA; and a $159,000 New York State Energy Research and Development Agency (NYSERDA) energy efficiency grant. The state’s investment leveraged $12.8 million in tax credit equity along with $4.6 million in financing from Citibank, with part of the financing coming from settlement funds. The Governor established the Medicaid Redesign Team (MRT) in 2012 with the mission of identifying more positive therapeutic results for Medicaid clients while simultaneously identifying savings on Medicaid expenditures. In what was a win for the state and a win for vulnerable New Yorkers, the MRT found $34.3 billion in savings for taxpayers, with Medicaid Redesign Team Program funding subsidizing supportive housing. Founded in 1985 by homeless advocate George T. McDonald, The Doe Fund provides life-transforming services, supportive and transitional housing, and economic opportunity for formerly homeless and incarcerated men, veterans, and people living with AIDS. Through its pioneering work in social enterprise, including the acclaimed Ready, Willing & Able program, The Doe Fund reduces recidivism, improves the quality of life in city neighborhoods, and fosters permanent economic independence among its clients. Webster Green is the most recent example of The Doe Fund’s development of affordable and supportive housing for vulnerable populations, including the formerly homeless and those at risk of becoming homeless. The New York State Department of Health’s unwavering commitment to protecting the health of all New Yorkers is reflected in all its activities, whether it’s improving access to health care or doing research to better understand disease. The mission at NYSDOH is to protect, improve and promote the health, productivity and well-being of all New Yorkers. Our vision is that New Yorkers will be the healthiest people in the nation, protected from health threats, and have access to quality, evidence-based, cost-effective health services.